The winter nights have drawn in so why not look at our beautiful evening skies? Perhaps you'll see a cigar-shaped alien space ship (or meteor?) gliding through it. 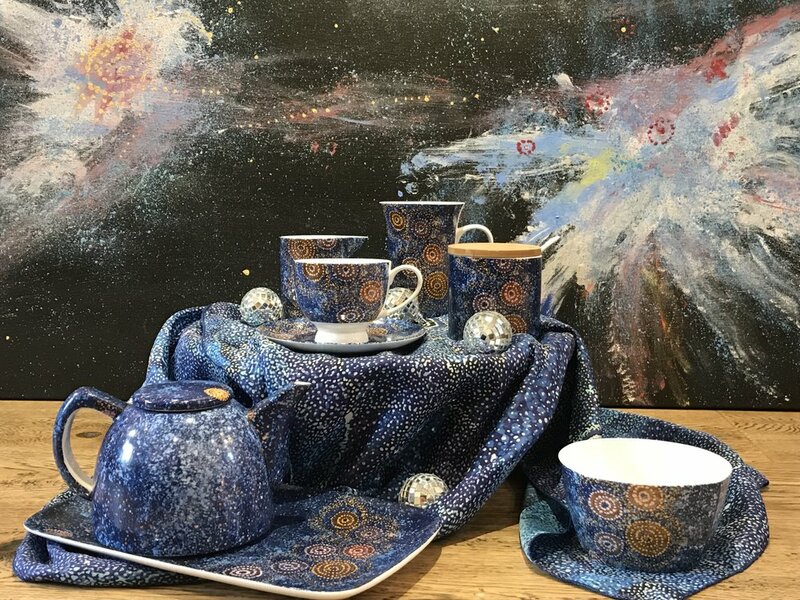 If you're sky is light polluted take inspiration from Australia's milky way as depicted on these teapots, mugs, sugar pots, cup and saucers, milk jugs and bowls. Alma's paintings were a sell out at her only solo UK exhibition held at Bay Gallery Home but her chinaware continues to be one of our most popular designs. Available online www.baygalleryhome.com or in the gallery. New homeware and gift ideas have arrived! Bay Gallery Home has exciting new products we've added to our homeware and gift range including scarfs, hand moisturisers and new editions to our stunning, colourful fine bone china range. We are situated in Tetbury, the Cotswolds. Tetbury is an ancient royal town with many beautiful independent shops. Prince Charles lives down the road so you may bump into royalty! We are also very close to Bath and Bristol. If you're coming from London you come off the M4 at Junction 17. If you can't make it the Bay Gallery Home in Tetbury you can always make your purchases online.